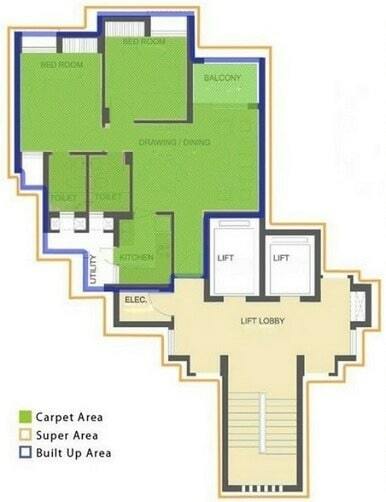 Plinth area and carpet area of a building is measured for estimation and calculation of building cost. It is also a measure of usable space of building. 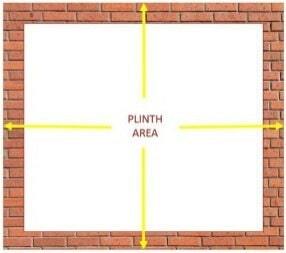 Plinth area is the covered built-up area measured at the floor level of any storey or at the floor level of the basement. Plinth area is also called as built-up area and is the entire area occupied by the building including internal and external walls. Plinth area is generally 10-20% more than carpet area. Carpet area the covered area of the usable spaces of rooms at any floor. It is measured between walls to walls within the building and is the sum of the actual areas of the rooms where you can carpet. For measurement, the lengths and widths should be measured nearest to 0.01m and areas should be rounded to 0.01 m2. In Case of feet system, length should be measured to nearest 1 inch. Area of the wall at the floor level, excluding plinth offsets. If there are any common walls between two buildings, half of the area of such walls shall be considered in the plinth area. When building consists of columns projecting beyond the cladding, the plinth area is measured upto the external face of the cladding (in case of corrugated sheet, cladding outer edge of the corrugation is considered). Areas of the internal shaft for sanitary installations and garbage chute, electrical, telecom and firefighting services provided these do not exceed 2 m2 in area. Vertical duct for air conditioning and lift well including landing. Open projections of veranda, balconies and parapets, if the area is protected by projections, full area is included in plinth area, if the area is un-protected by projections, 50% of the area is included. Recess by cantilevering beyond external walls, bay window is the best example. If the recess height is up to 1.0 meter, 25% of such area shall be included. If the recess height is 1.0 to 2.0 meters, 50% of such area shall be included. If the recess height is above 2.0 meters, 100% of such area shall be included. Area of architectural band, cornice, etc. Towers, turrets, domes projecting above the terrace level at terrace. Wall area is also included in plinth area calculation. Wall area is the area on plan occupied by walls on any particular floor. It includes the thickness of any finishing or dado tiles if the height of such wall is more than 1m from floor finish. For the calculation of approximate cost of the building using plinth area method, the sum of the built-up area of all floors including based basement is considered as the plinth area of the building.